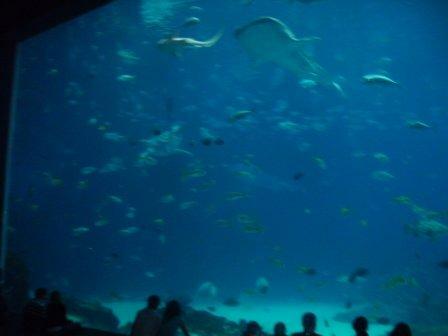 Oct. 29—We have talked about visiting the Georgia Aquarium almost since the day it opened. Every advertisement we have seen shows a completely immersive experience, as visitors walk through one of the largest sea-water tanks in the world and spy sharks, manta rays, and other fish swimming overhead. We planned this vacation, which started with a visit to Rob and his family in Raleigh, to have its highlight at the aquarium. Our plan was to stay at an RV park that was supposedly a few miles outside of Atlanta. As we drove, however, Garmina (our GPS) kept telling us that we had more than 60 miles to the RV park, yet the signs said that Atlanta was only 50 miles away. How could that be? The map in Passport America showed it on I85. I finally double checked and discovered that the campground directory had misplaced the location of the campground. It wasn’t on I85; it was north of Atlanta on I75. Obviously, that would not do for us. Since the day was early, and Garmina told us we could be in Atlanta at the aquarium by about 11:30 a.m., we decided to take in the tanks today. Atlanta doesn’t have much street parking. Our final solution? We found a Target, where we were given permission to leave the motorhome for a few hours. Thank you, Target! Onward to the aquarium, and a series of disappointments. Disappointment No. 1—parking. The parking garage adjacent to the aquarium does not post its price, and you don’t find out how much until you are ready to leave. The cost was $10. We could have parked in a lot across the street for $5. Disappointment No. 3—the aquarium itself. Yes, the tank is huge. Yes, they have four huge whale sharks. And yes, the tank is built so that you walk through it and the fish swim above you, simulating a diving excursion. All of that is nice, but it wasn’t worth the price of admission. The aquarium has several themed areas, and many smaller tanks. We saw a few fish we had never seen before. But all-in-all, it was a big disappointment. 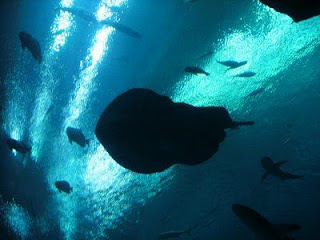 If you have never been to an aquarium, I guess you would like it. But I’ve been to the Shedd Aquarium in Chicago many, many times. I don’t know how much they charge, but whatever it is, you get more value, including several shows, at no extra cost. After the aquarium, we considered visiting Underground Atlanta. Garmina found it for us, but again, parking was an issue (just the car, not the RV). So we forfeited that opportunity, headed by to Baby, and headed out of Atlanta. Tonight, because of a lack of campgrounds, we are boondocking (dry camping) in a Walmart parking lot in Warner-Robins, Ga., where we will visit an air museum tomorrow. We also anticipate visiting the Andersonville Civil War memorial, which is just a couple miles up the road, near Macon. I have a hunch we won’t be disappointed in either of these visits.